I went to the PO in Spring Gardens, Manchester, last week, to see if they had the Rivers set. Lucky Dip machine 1 was down, and the other two had the original Machin head with no date code. So I went to Bolton, whose single machine has yet to let me down, and got my Rivers. Whilst in Manchester, I was intrigued by the screen prompt to 'post something now', so I pretended I had a letter to post. It offered me 2nd Class, so I selected it. To my utter amazement it spat out a post-dated text-only label with a 'deliver to' post code. This label is marked 'P & G', which the 'stamps' are not. Will the real 'Post and Go' stamps please reveal themselves?! 'Post Something Now' has been an option ever since the machines were installed in Post Offices. The machine produces what Royal Mail refers to as 'Post and Go Labels' as distinct from 'Post and Go Stamps' (their name for Faststamps). They are the poor relations of Post and Go - but although they are not stamps listed in the catalogue, they ought to be scarcer simply because so few people collect them. 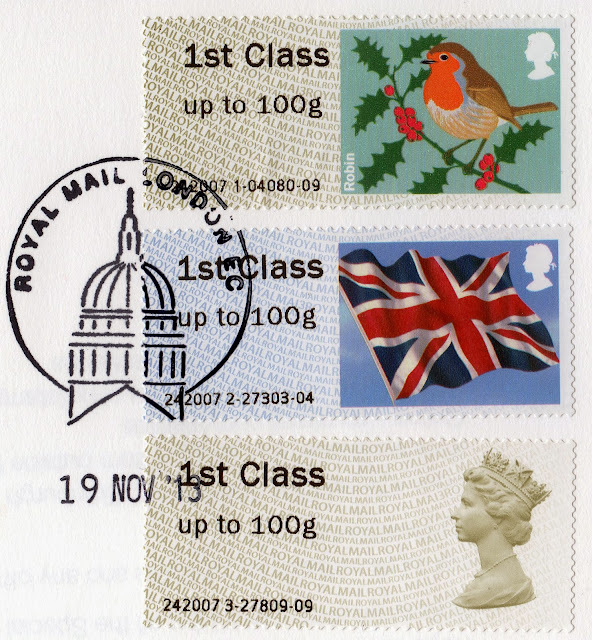 The original version is shown here http://postagelabelsuk.com/2008/10/five-stamps-and-six-labels-a-set-of-eleven/ but the links to the other 7 'values' are not there anymore. The Post & Go stamps (not the labels) are included in the new MICHEL ATM catalogue 2013/2014. You will find all issues and all printing varieties, as well the sets, FDC etc., not to forget the sets issued by the Philatelic Bureau. How dare Royal Mail call their stamps "Post & Go" when Norvic says they are "Faststamps". Methinks Norvic are fast becoming a laughing stock. Just look at your hastily corrected Tudor Street with half the content still Tower Hill. Very funny. Thanks for your correction; I had been working on some postmarks when I ascribed these to Tower Hill rather than Tudor Street and made a hasty correction before getting on with satisfying paying customers. It's easy to hide behind your Anonymous posts rather than make your identity known - or at least an online user name. If you don't like my terminology feel free to use your own in your own blog. machine 1 did not give a stamp, and machine 3 did not give a receipt and there was nobody there to complain to. Further, is there any way that these machines could indicate what type (Rivers, Robins etc) of stamp is being dispensed ? But then, as a collector rather than an everyday user, that's probably a rhetorical question. Just to update Tudor Street as of today the 30th k1 MA13 Robin, k2 Undated Flag and k3 Pond2. All kiosks working properly, what a surprise !!!!!! Thank you Malcolm for your useful updates on several areas. Happy New Year!